And I thought my family was dysfunctional! 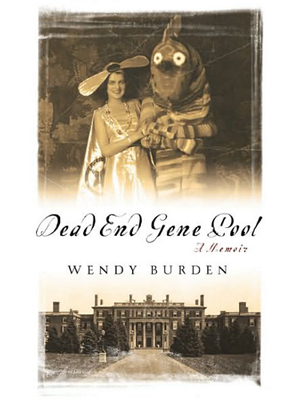 Recently, I’ve been researching my family tree and a review of Dead End Gene Pool by Wendy Burden in an email newsletter caught my eye. The book is quite a page turner. This memoir, written by the great-great-great-great granddaughter of Cornelius Vanderbilt, provides a probing look into the life of a very wealthy family with more problems than one can even imagine. Their story has all the elements of a great work of fiction, but the suicides, mental illnesses, alcoholism, and drug addictions in this family are unfortunately very real. I think the 55-year-old author was courageous in telling the story of her life and that of her immediate family. Knowing that writing heals, I read the book with the almost constant thought that I hoped Wendy Burden found healing while writing this book. Her life and the neglect she suffered at the hands of people who apparently had no real love or consideration for her well-being was truly heartbreaking. The book is well written and not told in a vindictive voice but rather that of a survivor. After reading it, I wanted to know more about Wendy’s adult life because I found I cared for her as a person. I hope she will write more of her story as I would love to read it. This entry was posted in Uncategorized and tagged Burden, Vanderbilt. Bookmark the permalink.